The term "employee motivation techniques" is in my view a little mis-leading as it implies a tactical "quick fix" approach. 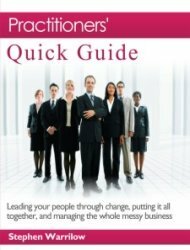 Whereas to achieve a peak performance from your people and in so doing, to create a genuine source of competitive advantage demands a strategic approach that embraces leadership style, corporate cultures and the supporting business and management processes. In practise this means establishing what is important to your people, communicating to them what is important to you and the organisation, and finding ways of meeting both their and your goals. This is what lies at the heart of employee motivation techniques. 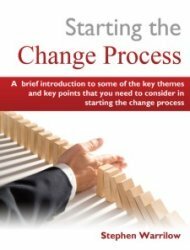 (1) Clarity in all areas - especially of the business need for the change, of the specifics of the change, the benefits of the change, and most importantly the impacts of the change. Also, at an individual level ensuring that people know precisely what is expected of them - i.e. you translate the vision into actionable steps. (2) Communication - constant communication; two-way communication; communication that explains clearly what is happening or not happening and why, that listens actively and demonstrates to people that you have thought through the impacts of the change on them, and that you are prepared to work with them to achieve their buy-in and commitment to the change. (3) Consistency - in all aspects of the way in which you lead the change; manage the delivery; handle the communication; and ensure the realisation of the benefits. 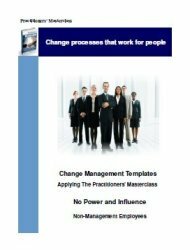 (4) Capability - constant attention to the management of the projects and initiatives that are delivering the capabilities into your organisation that will deliver the benefits. Jon R. Katzenbach formerly Senior Partner of Katzenbach Partners LLC, a consulting firm in New York City that specialised in leadership, team, and employee motivation techniques. In his book Peak Performance: Aligning the Hearts and Minds of Your Employees Katzenbach examined the leaders of some of America's most successful corporations and found distinct patterns to their employee motivation techniques and by which companies engage their employees to capitalise on emotional energy and consistently achieve higher levels of performance than their competition. All of these enterprises confirm that performance of the workforce is the distinctive competitive advantage of their business. Katzenbach captures the essence of what it takes in terms of employee motivation techniques to achieve peak performance and describes the differences in core values and management styles that deliver this. They pursue enterprise performance and worker fulfilment with equal rigor. 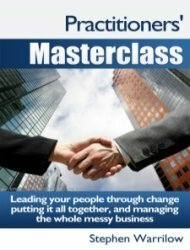 Through detailed case studies, he highlights the various sources of emotional energy specific to each organisation and the discipline companies need in order to follow their chosen path. The study concludes with guidelines for managers seeking to achieve better performance with their own workforces and gain the resulting competitive edge. The path any institution chooses must fit its business performance priorities, its marketplace circumstances and its workforce fulfillment needs, as well as unchangeable aspects of its culture and values. Here are the conditions, sources of energy and applied approaches that each of the five paths requires. 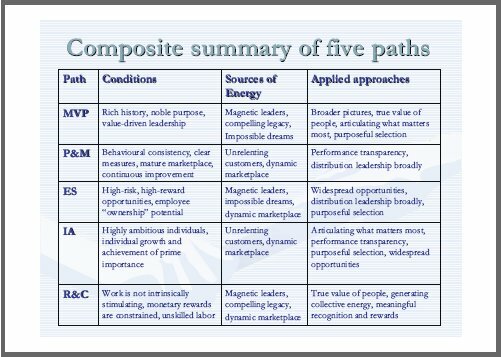 Katzenbach suggests that these paths create a framework of options for managers about where and how to generate emotional energy and how to channel that energy towards higher performance. As always, leadership commitment is essential to each path to strike a balance between enterprise performance and worker fulfilment. 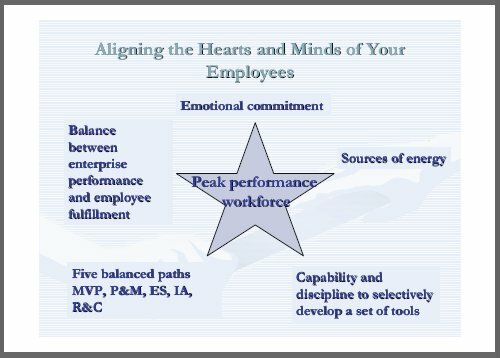 Rather than just simply employing a range of employee motivation techniques, each enterprise with a Peak Performance Workforce has a straightforward "workforce value proposition" that makes clear what "gives and gets" an employees can expect. Although the value proposition is unique for each company, those following a particular path reflect a similar value proposition that goes well beyond monetary awards and sometimes varies with particular segments of the employee population. 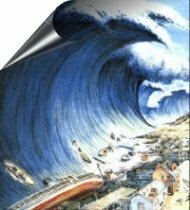 By "Peak Performance" Katzenbach means better than the norm, better than expected, better than the competition, and better than similar workforces in other places. We need to specify the critical segment (or entire workforce) whose collective performance forms the core of the institution's competitive advantage. The collective performance of these employee segments largely determines the success of the company. (1) A cohesive approach is essential, and cohesiveness demands executive leadership alignment. (2) Most of the best sources of emotional energy cannot be tapped without the efforts of executive leadership. 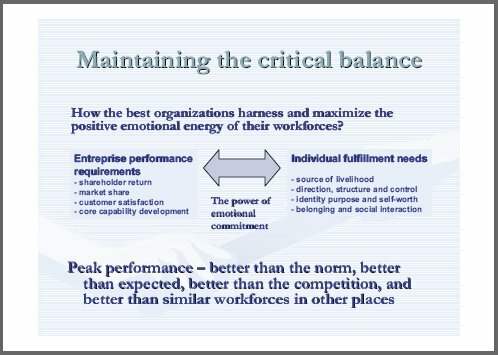 (3) Balancing enterprise performance and worker fulfilment requires trade-offs that can be made only at executive leadership levels. For the majority of this summary of Jon Katzenbach's employee motivation techniques, and the supporting graphics, I am indebted to Prof. Stéphane Haefliger. Chargé de cours MBA-HEC. Responsable du secteur public suisse romande KPMG HEC, Université de Lausanne.